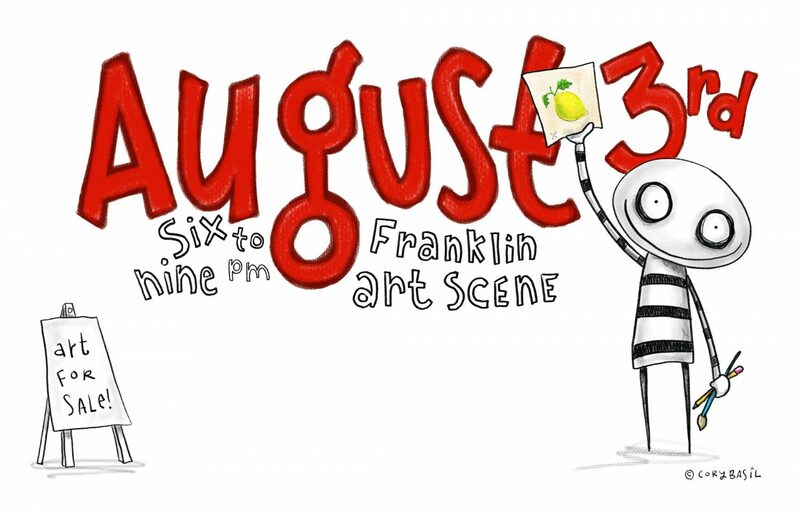 Franklin Art Scene returns on Friday, Aug. 3 and will feature more than 20 sites in Historic Downtown Franklin. Williamson County Archives will feature artist Tim Bush, an award-winning artist who makes guitar sculptures with blue tooth speakers. The guitar hangs like a piece of art work but functions like an amplifier for music. Guests will be able to connect to the speaker and play their choice of music during the August art crawl. The Franklin Art Scene is held on the first Friday of every month to highlight the local arts scene in Franklin. Coffee House on 2nd and Bridge, located at 144 Second Ave. N., will feature Susan Charest, the artist behind Sonshine Art who creates whimsical drawings in wood canvases. Charest makes her own wood canvases from recycled pine, ship-lap or cedar. Finnleys, located at 435 Main St., will host artist Jessica Melton, a self-taught embroidery artist who has been hand stitching embroidery art since 2014. Franklin First United Methodist Church, located at 148 Fifth Ave. S., will feature artist Mike Krupek whose art captures memories of old barns, churches and many of our treasured buildings that are quickly vanishing. Gallery 202, located at 202 2nd Ave. S., will feature works by Joe Parrot and Ken Gaidos. Parrot is a self-taught artist who currently paints full time and is dedicated to a lifelong pursuit of creative evolution and exploration. Ken Gaidos began wood turning in 2000 and continues to experiment with new ideas and techniques, including a native American basket inspired series. Hope Church, located at located at 137 Fourth Ave S., will host artist Michelle Rideout who has explored various mediums of art, but currently specializes in oil painting. Outdoor Classic Structures, located at 203 Second Ave. S., will feature the works of Olivia A. Myers, a lifelong artist who recently began painting and is inspired by abstract styles. Parks Realty, located at 415 Main St., will display the paintings of Amy Elizabeth Smith. Twine Graphics and Screen Printing, located at 304 Public Square, will feature works by Joel Barnett, an expressionist artist that explores our relationship with the unknown through colorful washes, line work and distressing. Visitors Center, located at 400 Main St. #130, will host Lynda Thompson, a local Franklin Artist whose original, signed prints can be found at various retail establishments. Winchester Antiques, located at 121 Second Ave. N., will display the works of Cathy Sudzius, a mosaic artist who uses tiles, broken pieces of plates and vases, beads, glass and other items within her work. Williamson County Archives, located at 611 W Main St., will feature artist Tim Bush, an award-winning television broadcaster and artist who creates hand crafted guitar sculptures out of repurposed and re-imagined materials.